Korean hair products are the next big thing. You heard it here first. Discover how the Lador Keratin Power Glue is an innovative hair treatment that gives you silky, healthy hair, especially if its color-damaged. Lador is a brand that sells Korean hair products that use a lot of the same ingredients Korean skin care products use. The whole idea behind the brand is to treat your hair with the same love and care that you give your face. In fact, its unique Keratin Power Glue treatment could be considered a serum for your hair. Its star ingredients are snail mucin (yes, you read that right, you can use snail mucin in your hair), which works to rebuild hair and strengthen damaged strands, keratin, which works to protect hair from heat damage, and moringa seed extract (found in the super popular Enature Moringa Cleansing Balm), which is loaded with vitamin A to enhance collagen production and create stronger-looking and feeling strands. 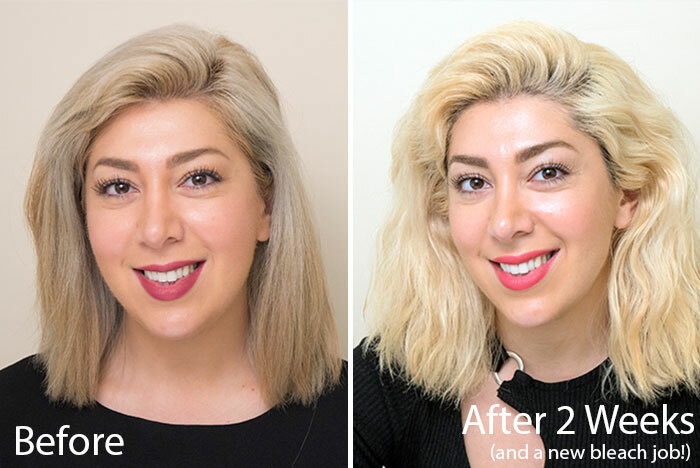 Below, Raha, Soko Glam’s manager of merchandising of retail, walks us through her experience using the Lador Keratin Power Glue for three weeks, and how it made her color-damaged hair look 10 times better. What issues were you dealing with when it came to your hair before testing Lador? I have thick, dry hair to begin with, and after all of the damage I’ve caused with not taking proper care of my hair and dyeing and bleaching it a ba-zillion times, I’m left dealing with extremely dry damaged, frizzy, and unmanageable hair. What do you usually do to your hair and what is your daily routine? I decided to go ash blonde, and I have naturally dark, thick black hair, so as you can imagine, I have bleached and toned my hair multiple times to get it as close to the color that I want to achieve (and I’m still not there). I dye or tone my hair every month. The result? Dry, color-damaged hair to a degree where I have to condition or put oil on my hair before shampooing it to avoid breakage. I don’t wash my hair every day. I try to wash it every other day or even every three days. Before taking a shower, I normally apply drugstore-bought argan oil and massage it all over my hair, especially on the ends. I leave it in for a little while (about 15 minutes or so) and then start my shower with shampooing, followed by conditioner, and immediately after I shower, I put a ton of products in my hair and brush it while its still wet to ensure it’s manageable and all the products are evenly distributed. To be honest, I have tried everything—from fancy salon-recommended products that cost an arm and a leg to drugstore products. I have tried the Living Proof line, Bumble and Bumble, Devacurl, Wen, and everything else you could think of. Currently, I use the OGX Moroccan Argan Oil Shampoo and conditioner, Alterna Caviar CC Cream for Hair, and the MorraccanOil Treatment. I don’t really have time to style my hair, so most of the time I just put as much product in it to weigh it down and avoid the frizz, and then let it air dry. Once it gets dry and out of control, I have no choice but to reach for my hair tie and put it in a bun. When I actually have the chance and my hair is strong enough to take it, I use my flatiron to straighten it or I grab the curling iron to give it the fake beachy wave style. Why were you excited to they Lador? I was excited to try Lador for a couple of reasons. First, the ingredients seemed natural, and that is really important to me. Looking at what I currently use, I feel like there are so many chemicals in the products and I wish I didn’t have to put those in my hair. Secondly, I was interested in the all-in-one hair treatment benefits of the Keratin Power Glue. Also, I have been obsessed with snail slime since I saw the wonderful results it had on my skin, so why not use it on my hair? 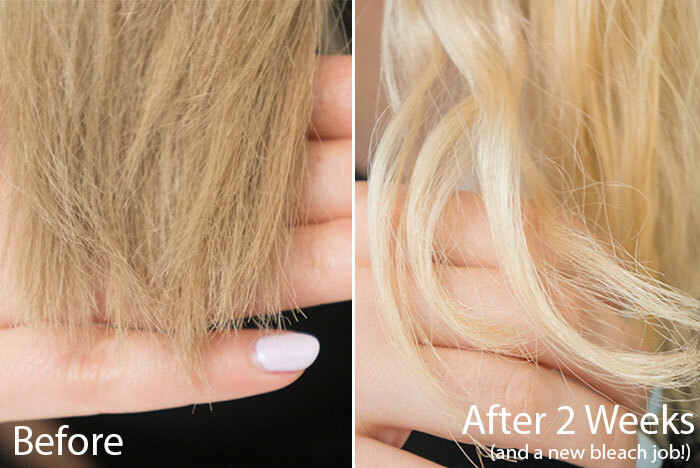 What did you notice immediately after starting to use the Keratin Power Glue? I have to say the texture of the product isn’t exactly what I expected. It’s white, thick, and creamy, but a little goes a long way. My hair absorbed it very quickly and it didn’t leave any residue. Not only did it hold the moisture inside and control the frizz all day, but it also helped hold my natural waves, so I could let my hair air-dry and still be presentable for the entire day. After two weeks of using it, my hair felt much stronger, a lot more moisturized, and healthier. I felt that the dullness started to fade away, and instead a natural healthy shine started to show. My hair was getting so strong that I actually dyed it again after two weeks of using the Lador serum. I felt my hair was getting so strong and healthy that it could actually take another bleaching process. What I really like about this product are the ingredients. Other than snail secretion filtrate, there is keratin to protect hair from heat damage and moringa seed oil, which is nutrient-packed. 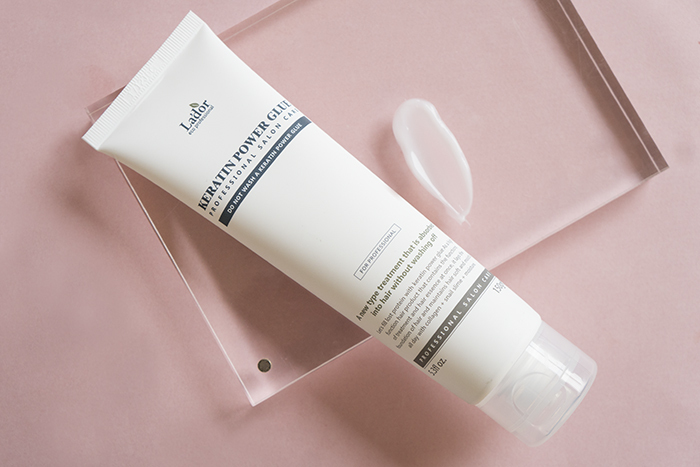 The cream is a rich source of vitamins, minerals, and amino acids, so my hair is absorbing exactly what it lacks: protein, collagen, and the amino acids in snail slime that will repair the damage that’s been done, and give it moisture and shine. The product functions as a hair treatment that I would normally pay a lot to get done professionally at a salon, as well as a hair essence, oil, and treatment that I would apply on a daily basis at home. I use it right after shower. 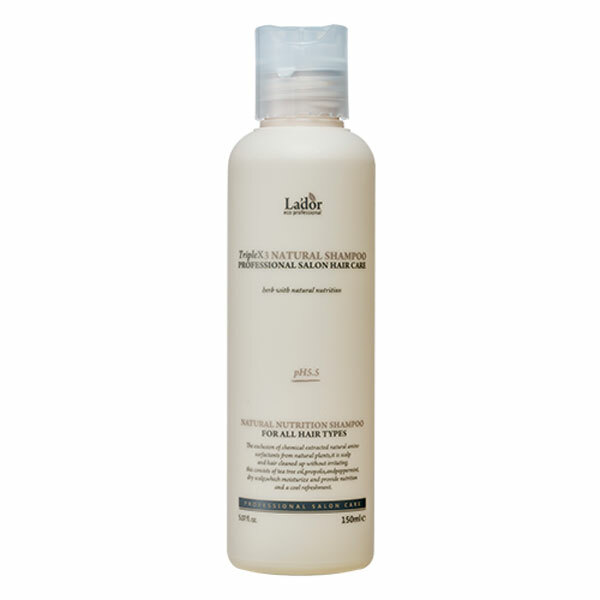 I wash my hair using the Lador Triplex Natural Shampoo and towel dry it, and then apply the Power Glue right after while my hair is still wet. Then I let it air-dry. I try to crunch my hair a bit and work the glue all over to help form the waves. 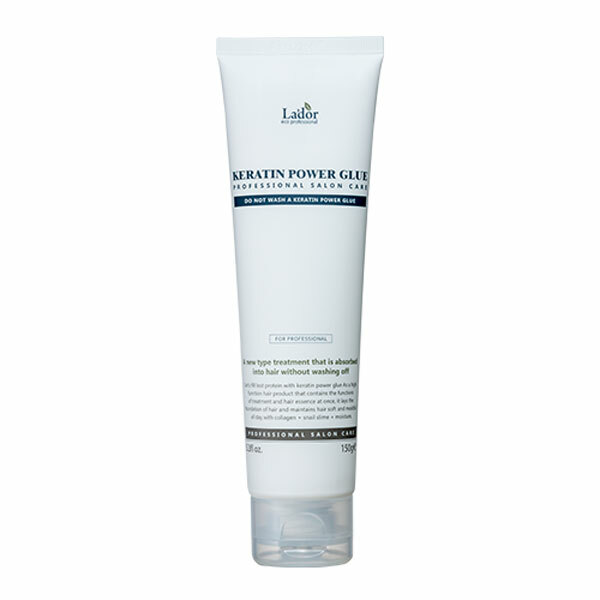 What makes the Keratin Power Glue different from other hair care products you’ve tried? 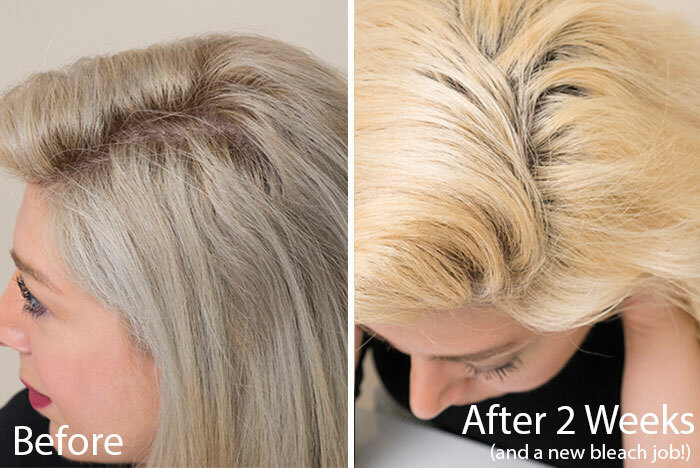 There are three things that made me love the Lador Power Glue: the ingredients, the fact that it’s truly an all-in-one treatment, and the fact that it gives immediate and real results. The results are so good that in the “before” photo I had to straighten my hair and the “after” photo is me wearing it naturally. Who would you recommend the Lador Keratin Power Glue to? I believe that if it can help my damaged hair, then it’s truly a wonderful product that can help everyone else! I would highly recommend it to anyone who is suffering from dry, dull hair, or color or bleached hair that is in need of a boost. + Do you love using Korean hair products? Share your thoughts in the comments below!